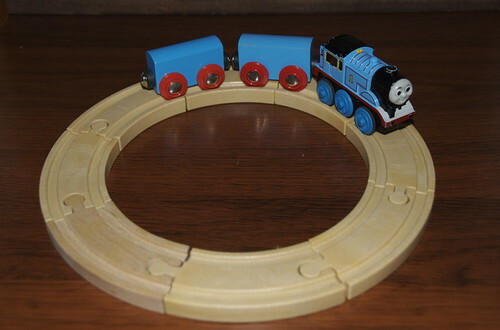 For every single birthday (and some Christmases) for the past four years, B has been the lucky recipient of tracks and accessories for his train collection. On those days where we evil parents have banned the Electronics, you can count on the boxes being hauled out (and they’ll stay out for several weeks). You might have noticed M&B are incredibly industrious when motivated, and even work together from time to time without bashing each other over the head with a tracks. The last time we broke out the tracks, Tomas set iTunes to play only songs with the word “Train” in the title. I was amazed at how many train songs we had in our play-list.